One thing I love about going to the mall is the soft pretzels you can get there. They are soft, chewy and delicious to munch on when you are wandering the mall. Did you know they are fairly easy to make at home? Seriously. You can do this. I know they have yeast in them and that makes you worry but you can do these. I can’t think of a better way to earn brownie points with your children than to make them some homemade soft pretzels. My kids go CRAZY when I make them. They get on the roof and sing my praises. No, not really, but they really do love them and appreciate having them at home. 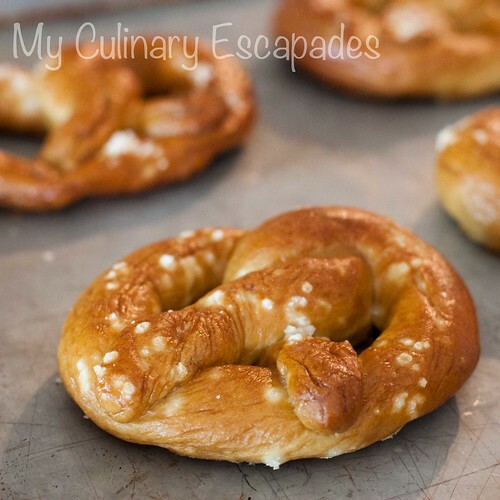 Making soft pretzels at home is my super power, what is yours? In all seriousness you can make these beauties. All it takes is a little time and a stand mixer with a dough hook. Can you imagine walking into your Super Bowl Party this coming weekend with a tray of homemade super pretzels? I don’t think your friends can either but I know they would love you to. I encourage you to go to the source link. 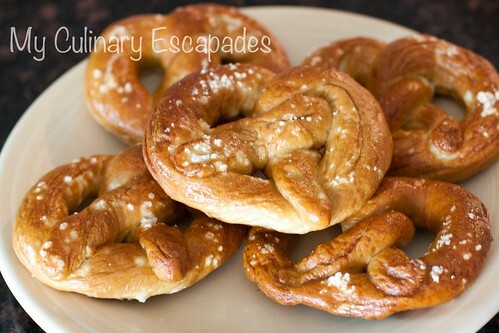 He has amazing step by step photos to make these pretzels. His pictures really show you how to complete this snack, especially if you are hesitant to try to make them, he makes it look easy. Pour warm water into bowl of an electric mixer. Attach the dough hook. In a small bowl, combine water and sugar, and stir to dissolve sugar. Sprinkle with yeast, and let sit 10 minutes; yeast should be foamy. Add 1 cup flour to yeast, and mix on low until combined. Add salt and 4 cups flour, and mix until combined, about 30 seconds. Beat on medium-low until dough pulls away from sides of bowl, about 1 1/2 minutes. Add 1/2 cup flour, and knead on low for 5 minutes. If dough is still wet and sticky, add 1/2 cup more flour, a little at a time; knead until combined, about 30 seconds more. Transfer to a lightly floured board, and knead about 5-6 times, or until smooth and elastic. Pour oil into a large bowl; swirl to coat sides. Drop the dough into the bowl, turning dough to completely cover all sides. Loosely cover with plastic wrap and a damp kitchen towel. Leave in a warm spot, I like using a turned off oven, for 1 hour, or until dough has doubled in size. Heat oven to 450 degrees. Line two baking sheets with parchment paper. Punch down dough to release the air. Transfer to a lightly floured board. Knead once or twice, divide into 16 even pieces. Roll one piece of dough at a time into an 18-inch-long strip. Twist into pretzels shape; transfer to prepared baking sheets. (Go to the Candid Appetite to see step by step pictures of how to twist.) Cover with plastic wrap and a kitchen towel. Let pretzels rest until they rise slightly, about 15 minutes. Meanwhile, fill a large, shallow pot with 2 inches of water. Bring to a boil. Add baking soda and sugar. Reduce to a simmer; transfer 3 to 4 pretzels to water. Poach for about 1 minute. Flip over the pretzels and cook for a minute longer. Use a slotted spoon to transfer pretzels back to the baking sheets. Continue until all pretzels are poached. Beat egg with 1 tablespoon water and brush pretzels with egg glaze. Sprinkle with the salt. Bake until golden brown, 12 to 15 minutes. Let cool on wire rack, or eat warm. Pretzels are best when eaten the same day, but will keep at room temperature, uncovered, for 2 days. Do not store in covered container or they will become soggy. My pretzels didn’t make it past the second day.